Sunrise: A Song of Two Humans (also known as Sunrise) is a 1927 American silent romantic comedy-drama directed by German director F. W. Murnau (in his American film debut) and starring George O'Brien, Janet Gaynor, and Margaret Livingston. The story was adapted by Carl Mayer from the short story "The Excursion to Tilsit", from the collection with the same title by Hermann Sudermann. 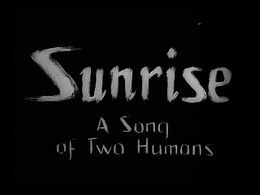 Murnau chose to use the then new Fox Movietone sound-on-film system, making Sunrise one of the first feature films with a synchronized musical score and sound effects soundtrack. The film incorporated Charles Gounod's 1872 composition Funeral March of a Marionette, which was later used as the theme for the television series Alfred Hitchcock Presents (1955–65). Frédéric Chopin's A minor prelude also features prominently in orchestral arrangement. Sunrise won the Academy Award for Unique and Artistic Picture at the 1st Academy Awards in 1929. 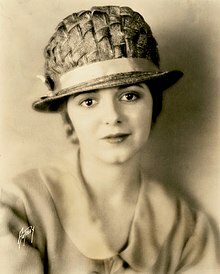 Janet Gaynor won the first Academy Award for Best Actress in a Leading Role for her performance in the film (she also won for her performances in 1927's 7th Heaven and 1928's Street Angel). The film's legacy has endured, and it is now widely considered a masterpiece and one of the greatest films ever made. Many have called it the greatest film of the silent era. In 1989, Sunrise was selected for preservation in the National Film Registry of the United States Library of Congress for films that are "culturally, historically, or aesthetically significant". The Academy Film Archive preserved Sunrise in 2004. The 2007 update of the American Film Institute's list of the 100 greatest American films ranked it number 82, and the British Film Institute's 2012 Sight & Sound critics' poll named it the fifth-best film in the history of motion pictures, while directors named it 22nd. Full of cinematic innovations, the groundbreaking cinematography (by Charles Rosher and Karl Struss) features particularly praised tracking shots. Titles appear sparingly, with long sequences of pure action and the bulk of the story told in Murnau's signature style. The extensive use of forced perspective is striking, particularly in a shot of the City with normal-sized people and sets in the foreground and smaller figures in the background by much smaller sets. Mordaunt Hall of The New York Times hailed Sunrise as "A Film Masterpiece". A reviewer for TIME, however, called its story "meagre" while writing that the film overall "manages to remain picturesquely soporific for a long evening." Sunrise is now widely considered by film critics and historians to be one of the greatest films ever made. 20th Century Fox originally released Sunrise on DVD in Region 1, but only as a special limited edition available only by mailing in proofs-of-purchase for other DVD titles in their "20th Century Fox Studio Classics" line, or as part of the box set Studio Classics: The 'Best Picture' Collection. The DVD includes commentary, a copy of the film's trailer, details about Murnau's lost film Four Devils, outtakes, and many more features. ^ a b "The Screen", Mordaunt Hall, The New York Times, September 24, 1927. ^ Bird, David (September 15, 1984). "Janet Gaynor Is Dead At 77; First 'Best Actress' Winner". nytimes.com. Retrieved March 30, 2015. ^ Eagan, Daniel. America's Film Legacy: The Authoritative Guide to the Landmark Movies in the National Film Registry. New York: Continuum, 2010, p. 131–133. ^ "100 Years...100 Movies" (PDF). American Film Institute. Retrieved 2009-09-18. ^ "NY Times: Sunrise: A Song of Two Humans". NY Times. Retrieved 2008-12-07. ^ Galloway, Chris (February 26, 2010). "Sunrise [Blu-ray] (1927)". CriterionForum.org. Wikimedia Commons has media related to Sunrise: A Song of Two Humans. This page was last edited on 17 February 2019, at 05:56 (UTC).